The 2018 FIFA World Cup in Russia was a major success. But one of the biggest questions was what will happen to the stadiums in Russia after the circus would leave town? During the early rounds of the Russian Premier Liga and Football National League attendance numbers were up and Mordovia Saransk in the FNL, in particular, impressed. Mordovia Saransk welcomed 26,000 for their first post-World Cup game. In general, Russia’s second division, in particular, posted fantastic attendance numbers throughout the fall. In August Russia’s FNL bosted impressive attendance numbers and an average attendance of around 6,000 over the first eight matchdays. That means the Russian second division currently ranks among France’s Ligue 2 (6,290 on average) and Italy’s Serie B (7,008 on average last season). Watch Europa League football live. Book your custom European football travel tour by visiting Nickes.com! The party could be over, however, according to a report published in Championat this week. Championat visited one of Mordovia’s home games at the end of March and found the stadium completely deserted. Mordovia Saransk – Is the party over? One of the questions the article asked was whether the post-World Cup boom was all a myth? With ticket prices ranging from 100 to 200 roubles ($1.5 to $3) prices at Mordovia’s World Cup stadium are not exuberant. Yet there were no fans at the stadium. The entire Championat article, in fact, highlights the empty space inside the stadium. Meanwhile, a club official told the Russian sports outlet that the post-World Cup boom was mostly due to officials handing out free tickets. “No one goes when they have to pay,” the official said. The example, of Mordovia Saransk, however, is worrying. Currently, in 12th place in the FNL standings, Mordovia Saransk have first division history, but at the same time, the city’s inclusion as a World Cup host raised some eyebrows. 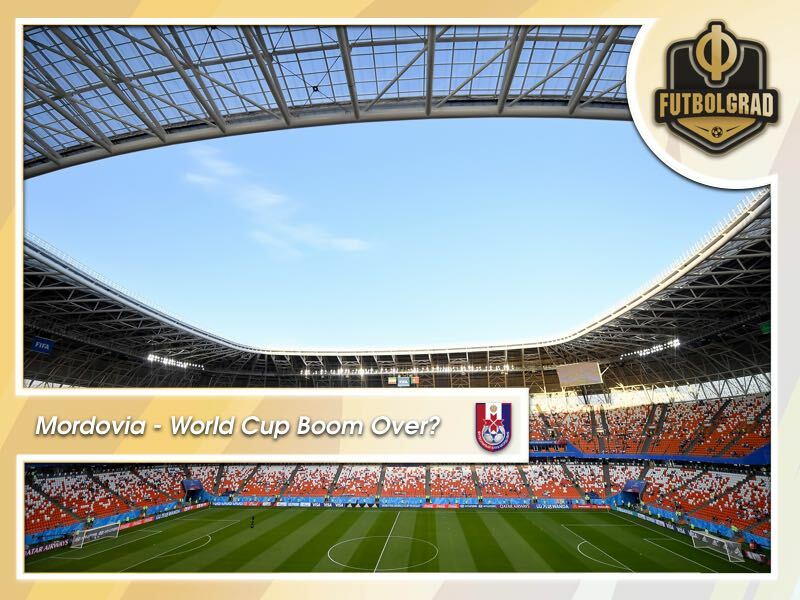 There have been arguments that Mordovia’s inclusion as a World Cup city was political. With a population of 834,755 people, the Republic of Mordovia is a relative small republic in which Mordvins make up about 40% of the population. Meanwhile, the city of Saransk has a population of just 300,000 and to fill the stadium regularly every tenth citizen of the city would have to show up. Furthermore, it does not help that Mordovia Saransk are more of a mid-table team in the second division rather than an RPL contender. But politics matter in Russia, Mordovia with its large ethnic population is one of the republics Russia keeps an eye on when it comes to separatism. Hence, like it is the case in the Caucasus and also with Tatarstan there is a carrot and stick approach in Russia to keep trouble makers in line. The carrot is massive infrastructure projects and awarding sporting events, Saransk, in fact, boasts a vast array of sporting events throughout the year. The stick is obvious; military incursion like it was twice the case in Chechnya. But in fairness, Mordovia Saransk are not exactly a football hotbed. Furthermore, the Russian winter always makes football from late October to late March a tough sell, not just in the FNL but also in the RPL. Finally, in Russia’s top division overall attendance is still above the 2017/18 average. Last season 13,956 people, on average, attended RPL games. That number is up to 16,508 per game following matchday 22. It certainly helps that there are more top class facilities among Russia’s first division clubs. Aside from the World Cup stadiums in Moscow (Spartak), Rostov, Samara, Kazan, Yekaterinburg and St. Petersburg the Russian Premier Liga also welcomed new stadiums in Krasnodar, Grozny and two seasons in Moscow (CSKA and, after years of delay, Dinamo’s new stadium). The Russian Premier Liga is also aided by plenty of excitement in the title race. Just four points separate league leaders Zenit and their closest follower Krasnodar at the moment. In fact, the RPL is one of the few European top leagues, a label that is fitting given that the RPL is currently in sixth place in the UEFA co-efficient country ranking. Furthermore, attendance numbers from this last weekend’s games in the Football National League show that there is still plenty of interest in games. Rotor Volgograd, for example, welcomed 25,736 people for their 1-0 home win over Baltika Kaliningrad. Meanwhile, Sochi, which has had some problems with attendance had 6,124 people visit their home game against Tyumen. That might not sound a lot given the size of the Sochi’s Fisht Stadium, but it is above the average of what clubs draw in many other second divisions around Europe. Furthermore, as above-mentioned, the Russian winter has played some havoc with attendance numbers overall in both top flights and with the spring around the corner those numbers more than likely will rebound. 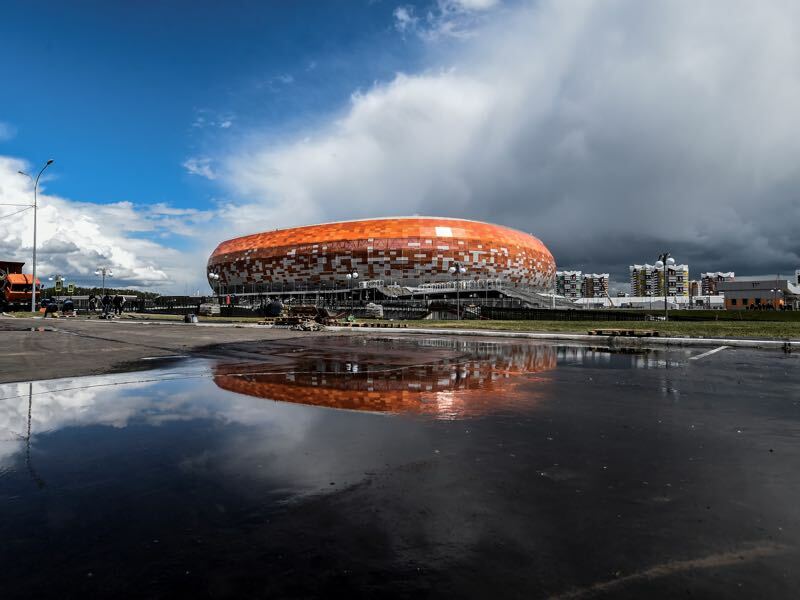 In other words, it might be too early to discuss the demise of Russia’s post-World Cup attendance boom at the same time the example of Mordovia highlights that Russia also has some work to do to make all World Cup stadiums sustainable for the long-term.